Thursday, June 6th, 2019 at Veterans Memorial Stadium, Clovis Ca. Parents and guardians of the graduating class of 2019. 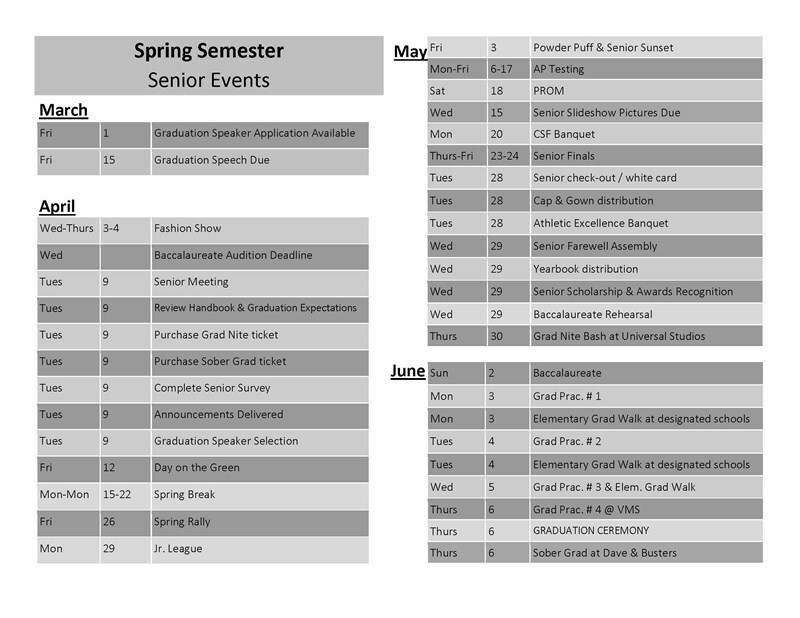 There are a number of senior activities on the horizon such as Prom, Grad Nite, Farwell Assembly culminating on June 6 with the Graduation Ceremony that your child has worked so diligently for. We want to make sure that your student is able to participate in these events. Your child was asked to sign the Senior Expectations Contract. A copy of the contract is below. 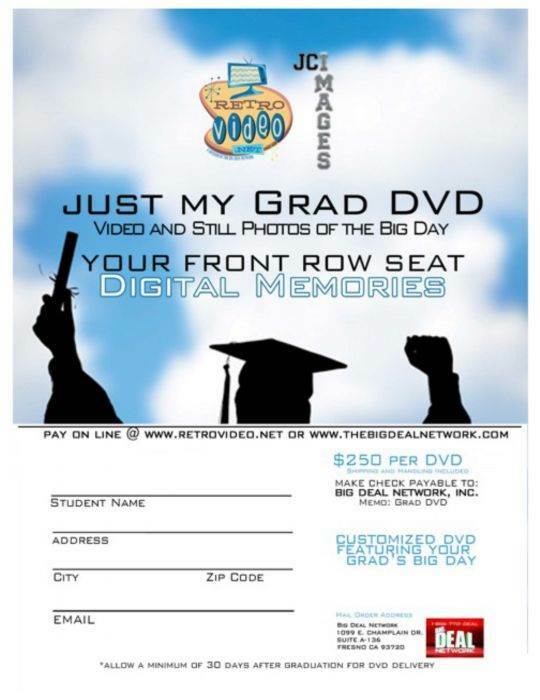 In addition, there is a form that asks for a voluntary donation of $10 to offset the cost of graduation gown rentals, and keepsake cap. You and your family may also voluntarily choose to purchase your child’s tassel and diploma case for $ 29.95 from Graduate Services. Dance begins at 8:00 p.m. and ends at 11:00 p.m. Bids will be available for both Juniors and Seniors at school. A parent signed dance contract is required for eachstudent/guest to buy a bid. Guidelines for formal dresses: dresses that are strapless or have spaghetti strap are acceptable. Dresses should not expose bare midriffs or have inappropriate key hole designs or other cutouts and should be appropriate in length. Dresses should follow the other guidelines standards within the CUSD dress code. Guideline for tuxedos/suits: collared shirt with tie (neck tie or bow tie), formal jackets dress pants and dress shoes. Guests must be under 21 yrs. of age and have valid proof of age, (ie. CA driver’s license) and a guest pass. No guest younger than 9th grade will be allowed. Kenny Gilman Photography will be taking photographs. Picture packages can be purchased at the dance. Students must arrive by 8:30 p.m. and stay until 10:30 p.m. unless each student’s own parent picks them up. Students must be picked up by 11:30 p.m. or may forfeit the next Senior Activity. Ticket sales for Grad Nite will start at a special senior class meeting on Tuesday, April 9th, 2019. The cost is $160.00. NO payment plans. NO refunds. The price for “Grad Bash at Universal Studios” includes transportation on a charter bus, music, dancing and access to rides and attractions. Checks made payable to Clovis West High School with student’s name and ID # written on the memo line. Students must have their permission slips completed and full payment to save a spot on the bus. SPOTS CANNOT BE SAVED ON A SPECIFIC BUS FOR A FRIEND TO SIGN-UP LATER! You cannot sign up for a friend. Each student must sign-up themselves. 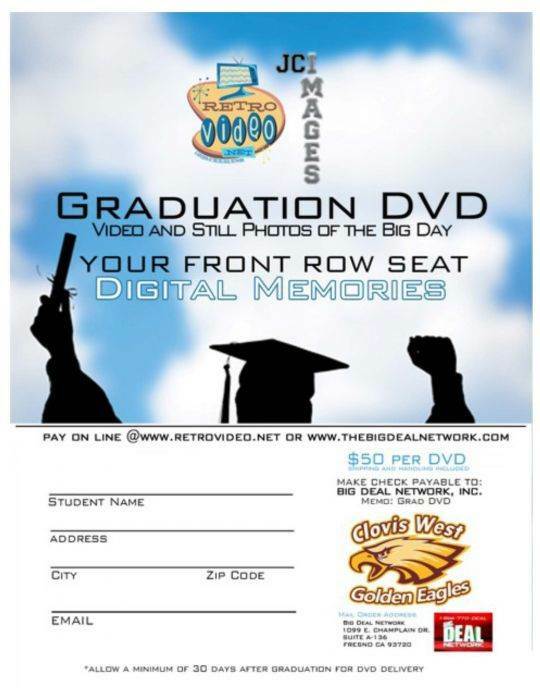 You will sign-up by the bus you want to ride on for Grad Bash to Universal Studios. There will be 7 buses. Not all students will get on the bus of their choice, as each bus has limited space. ONCE YOU SIGN UP ON A BUS, THERE WILL BE NO CHANGING OF BUSES. Arrive in cap and gown and go directly into the church. Doors will open at 4:30 p.m. for families. The Clovis West Baccalaureate Senior Class Ceremony is a Christian Ceremony which has been a long standing tradition for Clovis West. It is put on by the students and parents. Though not mandatory, all Clovis West Seniors are invited to join in, regardless of religious or non-religious affiliation. All Clovis West parents, family, friends, staff and the community are invited to attend. Celebrate this milestone occasion at the all night Sober Grad Party to honor graduated CW Seniors on Thursday, June 6th, 2019. This fun filled event takes place after graduation at Dave & Busters. Permission slip available at the top of this page. SOBER GRAD ENDS AT 3:00 A.M.